Likewise, the 42 Mark IIA* Matilda III tanks held by the Three Rivers Regiment, at this time, were similarly distributed throughout the regiment. T29826, a Mark IIA* Matilda III Close Support tank, named ALBERTA, of “A” Squadron Headquarters, the Calgary Regiment, which was taken-on-charge of the Canadian Army Overseas on 24 September 1941. Source: authors’ collection. Beginning in November 1941, as more of the new Infantry Tank Mark IV, Churchill (A22), became available for issue to 1st Canadian Army Tank Brigade, the Mark IIA* Matilda III tanks started to be withdrawn from service with the Three Rivers Regiment, and the Calgary Regiment. By 30 November, 12 Matilda tanks, had been withdrawn from the Three Rivers Regiment, leaving them with a total of 30 Mark IIA* Matilda III tanks remaining on their strength, while by the same date, the Calgary Regiment’s war diary reflects that they held 27 Mark IIA* Matilda III and two Mark IIA* Matilda III Close Support tanks. Thus, by 30 November, 1st Canadian Army Tank Brigade held a total of 57 Mark IIA* Matilda III and two Mark IIA* Matilda III Close Support tanks. During the month of December 1941, a total of 37 Mark IIA* Matilda III tanks, were struck-off-strength of the Canadian Army Overseas and returned to the British, through No. 1 Canadian Base Ordnance Depot. The Three Rivers Regiment, had returned their last Matilda tank to No. 1 Canadian Base Ordnance Depot, on 24 December 1941, while the Calgary Regiment had stopped using their Matilda tanks on 2 December, concentrating instead, on tank crew training with their newly issued Infantry Tank Mark IV, Churchill (A22) tanks. As of 31 December, the Three Rivers Regiment, and the Calgary Regiment, no longer held any Matilda tanks on their charge, having returned them all to No. 1 Canadian Base Ordnance Depot, in exchange for the new Infantry Tank Mark IV, Churchill (A22). Also, as of 31 December 1941, No. 1 Canadian Base Ordnance Depot held a total of 53 Mark IIA* Matilda III and two Mark IIA* Matilda III Close Support tanks, on Canadian charge. A rear view of T29826, a Mark IIA* Matilda III Close Support tank, of “A” Squadron Headquarters, the Calgary Regiment. The number ‘175,’ that appears on the plate mounted on the right-rear track guard, is the Arm of Service marking, by which the Calgary Regiment’s vehicles were identified throughout the period of the Second World War. For the Calgary Regiment, the Arm of Service marking, was a horizontally divided blue over brown coloured square, with the superimposed, centrally located three digit number ‘175,’ in white. Source: authors’ collection. Throughout January 1942, a further 37 Mark IIA* Matilda III and two Mark IIA* Matilda III Close Support tanks, were struck-off-strength of the Canadian Army in the United Kingdom, and returned to the British, from No. 1 Canadian Base Ordnance Depot, leaving a total of 15 Mark IIA* Matilda III tanks held on charge of the depot, as of 31 January 1942. 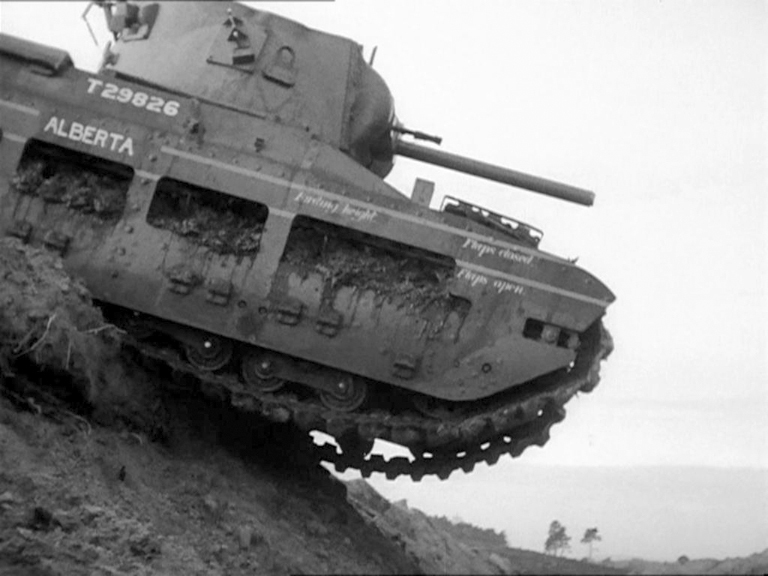 On 22 February 1942, a Mark IIA Matilda II (equipped with twin AEC diesel engines) was taken on Canadian strength from the British by No. 1 Canadian Base Ordnance Depot, and was in turn, issued to No. 1 Canadian Ordnance Reinforcement Unit, for the training of vehicle mechanics. Also, February 1942, saw a further 11 Mark IIA* Matilda III tanks struck-off-strength and returned to the British, leaving a total of four Mark IIA* Matilda III tanks held on charge of No. 1 Canadian Base Ordnance Depot, as of 28 February, 1942. On 4 November 1941, the Calgary Regiment was detailed to send a Mark IIA* Matilda III tank, to Grayshott, Hampshire, to have various pictures taken for the British War Office. 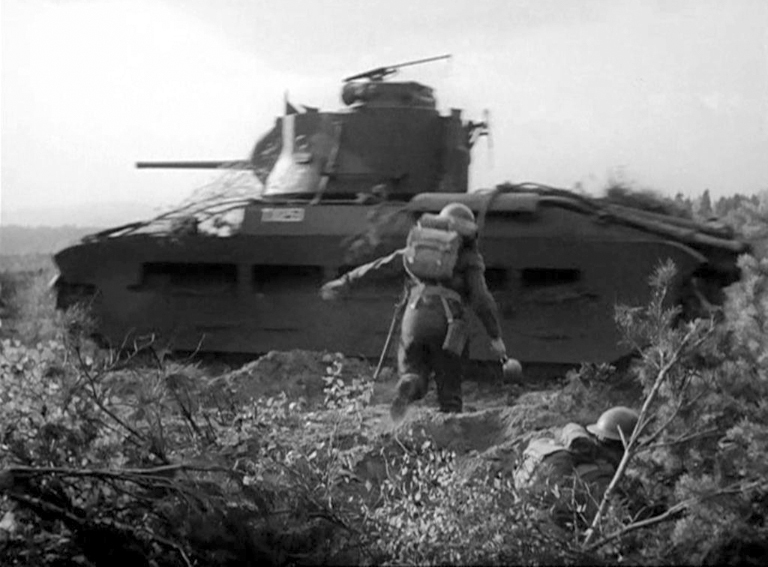 While involved in this task, this unidentified tank suffered a track breakage, to the delight of the photographers. 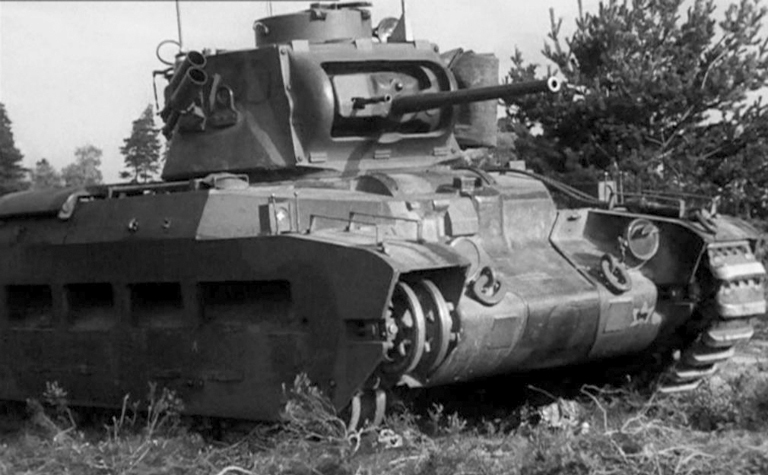 The marking, which appears on the lower-left corner of the nose plate, is the formation marking, that was used to identify vehicles of the 1st Canadian Army Tank Brigade, at this time. This formation sign was a gold or yellow maple leaf centred on a black background square, with a black left-facing image of a ram superimposed centrally on the maple leaf. Source: authors’ collection. These four Mark IIA* Matilda III tanks, were struck-off of Canadian charge and returned to the British, on 7 April 1942, thus leaving only the solitaire Mark IIA Matilda II tank on charge of No. 1 Canadian Ordnance Reinforcement Unit, as the only Matilda tank held on strength of the Canadian Army in the United Kingdom. As of 5 September 1942, this tank was still held by No. 1 Canadian Ordnance Reinforcement Unit, as reflected in a report entitled “A” Vehicles On Loan, that was submitted to the Director of Ordnance Services at Canadian Military Headquarters, London, from the officer commanding the Vehicle Census Branch of No. 4 Sub-Depot, No. 1 Canadian Base Ordnance Depot, Bordon Camp, Hampshire. This report listed all of the “A” vehicles that were held on the Canadian Census as being on loan from British sources. As of 1 December 1943, the Canadian Army in the United Kingdom, no longer held any type of infantry tank on strength, all (including the Mark IIA Matilda II tank held by No. 1 Canadian Ordnance Reinforcement Unit) had been struck-off of Canadian strength and returned to the British. Left-hand side view of T10253, a Mark IIA* Matilda III, barring the markings of “C” Squadron Headquarters, the Calgary Regiment (the ‘F’ within a circle on the turret side, just below the turret lifting eye), during a ‘Tank Hunting’ demonstration with a platoon of the 3rd Canadian Divisional Infantry Reinforcement Unit, in the vicinity of Headley, Hampshire, on 9 October 1941. Source: authors’ collection. 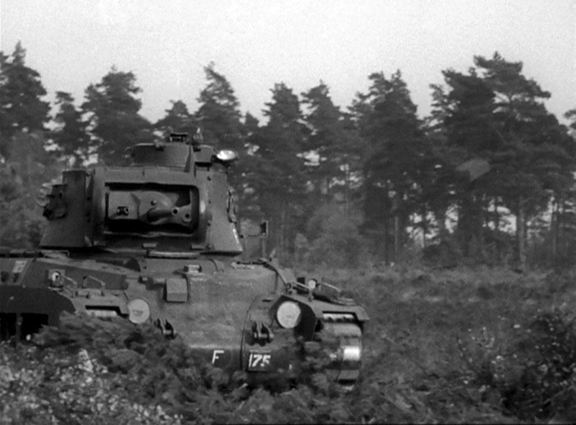 Front view of T10253, a Mark IIA* Matilda III, during a ‘Tank Hunting’ demonstration with a platoon of the 3rd Canadian Divisional Infantry Reinforcement Unit, in the vicinity of Headley, Hampshire, on 9 October 1941. Source: authors’ collection. two Pyrene fire extinguishers, came with each Matilda, one located in the driver’s compartment, while the other was located in the fighting compartment. A 30-foot steel towing hawser, along with four lifting and towing links, and six spare track links (with 12 spare track pins), was also provided with each tank. Both Makers’ Special tools (specific tools provided by the manufacturer with each tank), and a set of Driver’s tools, along with a gearbox clutch spanner, and a grease gun, with a ball swivel nozzle, were provided, along with a 5-ton capacity jack. Other miscellaneous tools provided were, a pickaxe, a General Service shovel, a 15-inch matchet, with sheath, and a 3-foot 6-inch crowbar. 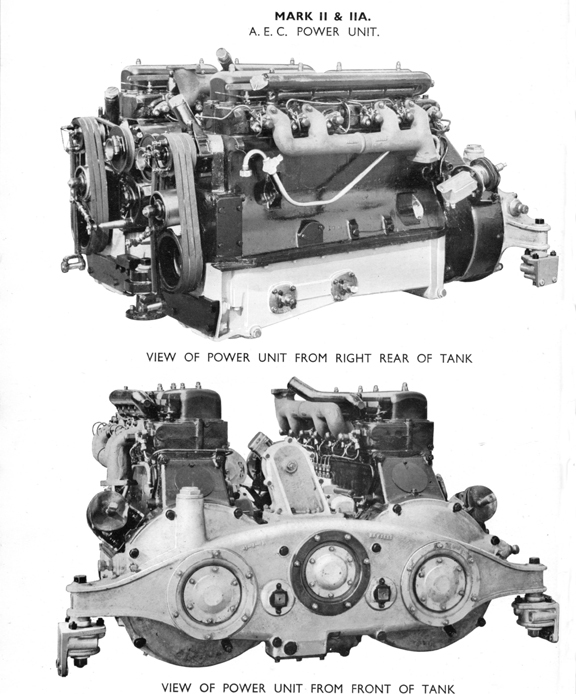 View of the twin AEC 6-cylinder diesel engines that were used in the Mark IIA Matilda II, as used by the Canadian Army Overseas. Source: authors’ collection. 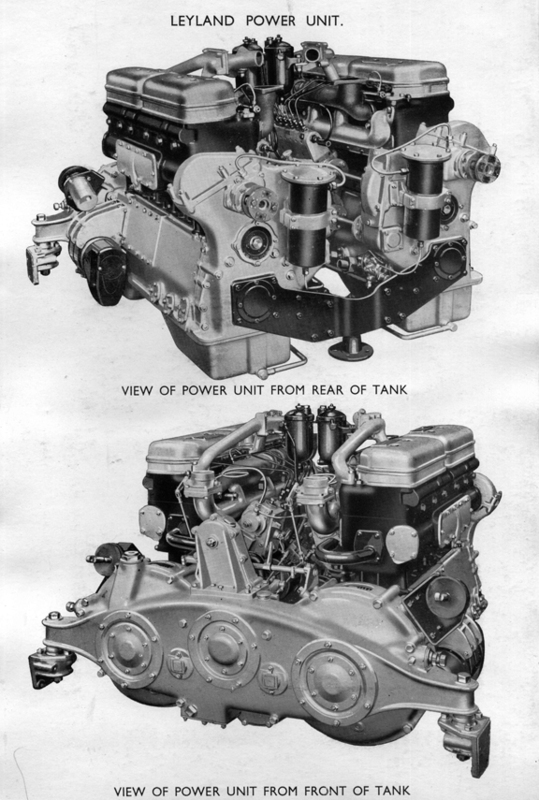 View of the twin Leyland 6-cylinder diesel engines that were used in the Mark IIA* Matilda III, and in the Mark IIA* Matilda III Close Support, as used by the Canadian Army Overseas. Source: authors’ collection. The author wishes to thank Miss Courtney Carrier, for proofing reading and offering constructive criticism, on my draft copies of this article, so as to keep it simple for all to read, and Peter Brown, for his insight and assistance with relevant material, and my good friend Clive M. Law, for providing photos from the MilArt photo archives, and for publishing this article, and lastly, my wife, Denise, for the extra set of eyes, while studying various photos, and for her never-ending support and understanding. You can rate this article by clicking on the stars, below. I came across a picture of a Matilda CS, reported to be in 1942 (looks to be winter of 1941-1942 based on how the people are dressed), with a 173 AoS on it, making it part of the Ontario Regiment if it’s a 1 CATB tank. The picture can be found on page 102 of Wydawnictwo Militaria 291 (Matilda 1939-1945). The name of the tank is “Crazy Issue”. According to the War Establishment for 1 CATB in 1941/42, the squadron HQs were supposed to have 2 CS tanks. 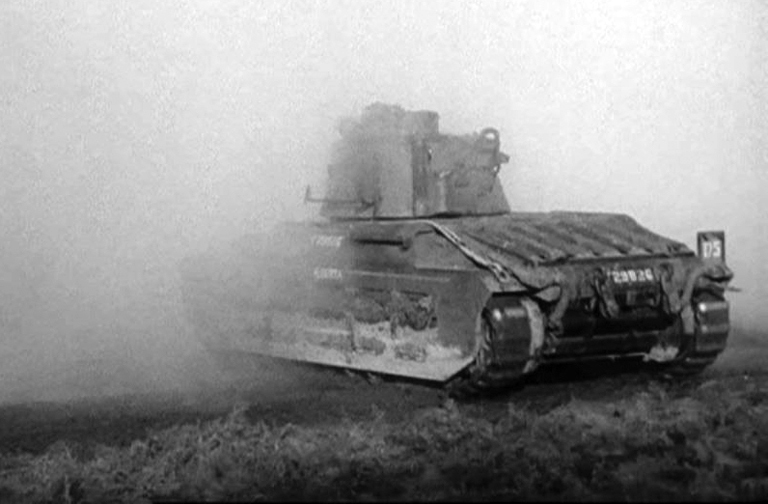 In “The Churchill Tank and the Canadian Armoured Corps”, it says that these CS tanks were made up of Churchill Is. However, by early 1942, most of the Churchill Is were back in the factory being reworked. As such, I suspect that Matilda CS tanks were used in their place for a short period of time. Do you have info on whether OntR used Matilda CS while their Churchill Is were being reworked? « The Saga of the Insignia of the 31st (Alta.) Recce. Regt.